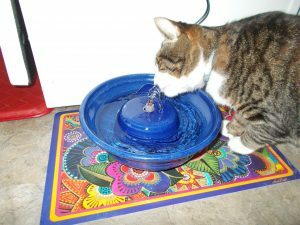 Why is a pet fountain important? A pet fountain is important because of a serious disease in cats and other pets called Urethral Obstruction. Many cats are prone to a blockage in their urethra, the tube that carries urine from the bladder, which can lead to a very serious condition and can, and often does result in death. Cats, dogs and other pets are prone to this condition. The obstruction is a pasty substance called Matrix but how and why some cats produce it is not known. It is thought that diet is a factor, as can be stress but what is known to prevent the disease is increased water intake. If there isn’t enough water available, or no attractive sources of water a pet may not drink enough. This leads to a very concentrated urine and it is in that the matrix tends to develop. 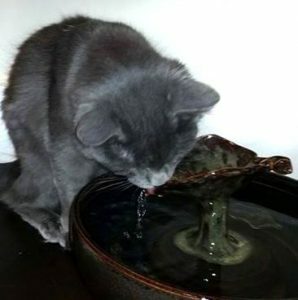 As still very much ‘wild’ creatures, cats crave moving water. When fresh, running water is available cats will drink more which dilutes their urine making them less prone to obstruction-forming matrix. In advanced cases when the cat has not been able to urinate for twenty four hours or more, he will be in extreme pain, clearly ill and close to death. Get him to a vet immediately. Feed canned food or raw food, which has a high water content.